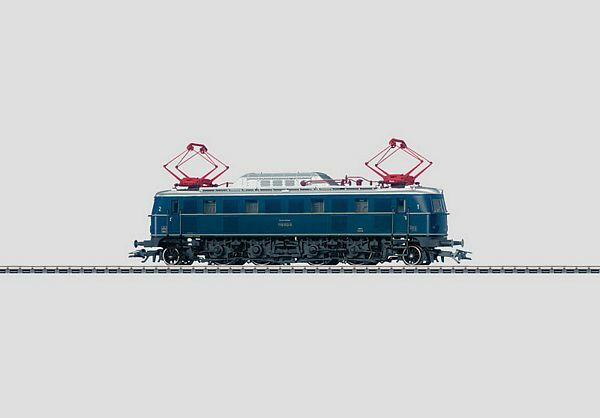 Prototype: German Federal Railroad (DB) class 119 in a blue paint scheme with older design lamps. The locomotive looks as it did at the beginning of the Seventies. Model: The locomotive has an mfx decoder and controlled Softdrive Sine high-efficiency propulsion. It also has a maintenance-free, compact design motor. 2 axles powered. Traction tires. The engineer's cabs and engine room have interior details. The locomotive body has many separately applied details. The locomotive comes in Era IV paint and lettering with large older design headlights and older design pantographs. The locomotive has a finely detailed frame and running gear with a realistic reproduction of the quill drive driving wheels. The headlights will work in conventional operation and can be controlled digitally. Length over the buffers 19.5 cm / 7-11/16.